Do you have an automatic gate at your home or work? Automated gate systems offer security and convenience. Keep in mind they can also be dangerous and potentially life threatening. buttons out of a child’s reach. • Never climb or reach through an automatic gate even if it is not moving. when opening or closing an automated gate. 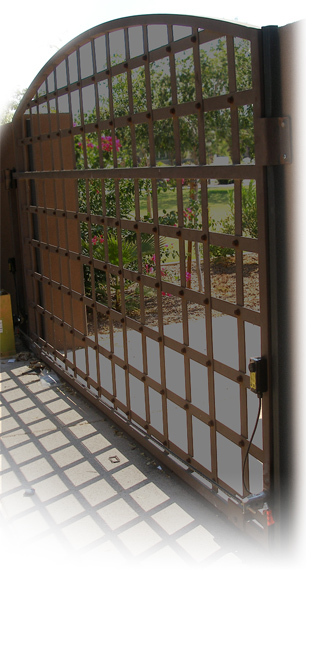 Motorized gate systems have numerous pinch points and entrapment zones. How do Miller Edge gate sensors work? You may have multiple sensitive gate edges installed in several different locations on or around your gate depending on the type of gate and how it functions. The gate edge sensor attaches to the gate, gate post or other potential entrapment zones or pinch points. The sensor itself is housed inside a sealed vinyl cover to protect the internal switching mechanism. Inside the cover is an electrically activated switch made up of two conductive strips, separated by a gap. When the sensor is compressed the conductive elements touch each other. Touching of these conductive strips activates the switch and sends an electrical signal to the motor to stop or reverse the door’s motion. Your professional gate installation & service company can help you decide where to place gate edge sensors to minimize the risk of damage or injury. You may have multiple photo optics installed, depending on the location and type of gate. Each photo optic sensor is made up of 2 individual units. One unit houses the “sending” light beam and the other houses the “receiving” beam. The system sends an invisible infrared beam of light from one unit to the other. When the beam of light is blocked by something in the way, the unit sends a signal to your gate operator motor to stop or reverse motion. When vehicles could be entering or exiting from either side of the gate, we suggest a complete unit on both the interior and exterior of the opening. Ask your professional gate installation company to recommend the best configuration for your gate system.